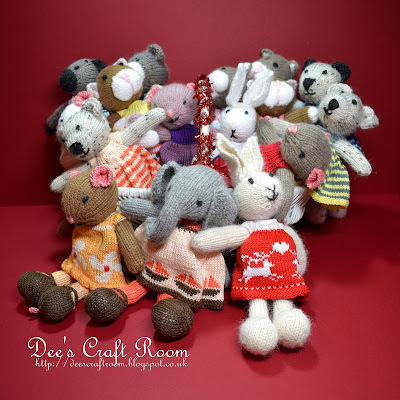 In recent weeks I have been sharing with you all of the Little Cotton Rabbits, - and their friends, which I made last year to give away as Christmas presents to my family and friends. They have all gone to new homes now but, before I started my wrapping, I took a couple of group photos to show them all in one place. There were too many to get them all into the basket, you should be able to pick out six teddy bears, four cats, four mice and elephant and a couple of rabbits. You have seen them all either individually or in family groups but I thought you would enjoy seeing them all together. 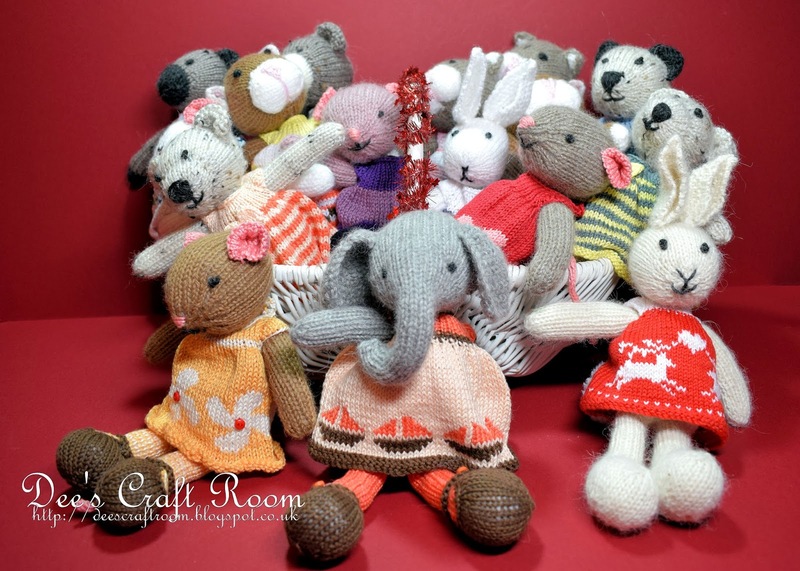 Trouble is, after I made and wrapped these knitted friends, I went on to make quite a few more ...... such a shame they did not make it into the group photo. Thank you so much, you are so very kind. They are a bit of a jumble but I thought it would be fun to see how many I had made at that point (I did go on to make another 5 before Christmas). I didn't see this! Such a great group photo! I will admit that the elephant is absolutely adorable! Great work on all of these! Thank you. I think the elephant is special too.